While Trinity’s tag line, “Amazing grace. Warm embrace” is a recent choice, what it conveys has been a part of Trinity over the years. In addition to celebrating the good news of the Christian Gospel, the tag line acknowledges the spirit of caring that surrounds all that happens under the roof at 2737 Bayview as well as beyond to wherever that love and care extend. In the last year, that “beyond” has included participation in a Classroom for Every Child campaign, assisting in sponsoring a Syrian refugee family and sending underprivileged children to camp -- to name a few of such projects undertaken. Within the fellowship that is Trinity, the “warm embrace” is present not only in our involvement together in worship, and in cooperative projects such as those listed above, but in gatherings for Bible study, coffee times following Sunday service along with other social gatherings throughout the year and in being there for each other in times of grief or need. Trinity’s beginnings trace back to 1952 when people from Glenview Presbyterian Church undertook to survey the district around the intersection of Bayview and Sheppard Avenues, with a view to establishing a Mission Church. In September of that year and with the sanction of East Toronto Presbytery, this committee met with a small group of interested residents from this rapidly developing community. 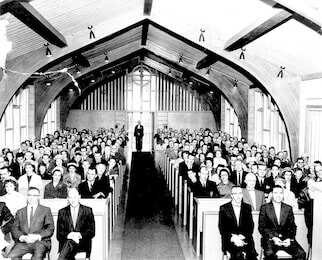 Worship began in a neighbouring school the next month, and in 1955 the original 250 seat sanctuary was dedicated at 2737 Bayview Ave. The details of the evolution from those small beginnings both in number of people and physical space to the present, are beyond the scope of a brief website description. But it is good to recognize the contributions of previous ministers and church people who have over the decades together fashioned both the worshipping community and physical buildings that are today’s Trinity. Our worship space is significant. Eyes are lifted up to the Cross. The Church is filled with natural light. It is spacious: a good place to be. The legacy of those who have gone before is this special place in which we gather to worship, study and visit. But it is also who we are, in the form and content of our worship, in the way we relate to God and to each other. The legacy along with the tag line define who we are today. As followers of Jesus, we want to take his words seriously. “Amazing grace. Warm embrace.” is logically connected in our minds. As forgiven children of God, there’s no option but to be forgiving ourselves, to be caring. No option but to follow Jesus words “Love your neighbour as yourself”. “Amazing grace. Warm embrace.” is descriptive of what has been, and at the same time, prescriptive of what is to be Trinity’s future. ​Trinity Presbyterian Church York Mills acknowledges the land on which we worship is within the traditional territory of the Huron-Wendat, Petun, Seneca and, most recently, the Mississaugas of the New Credit Indigenous peoples. Trinity as a congregation of the Presbyterian Church in Canada recognizes the long and rich history that predates the establishment of European colonies and acknowledges the territory’s significance for the Indigenous peoples who lived, and continue to live, in this territory.